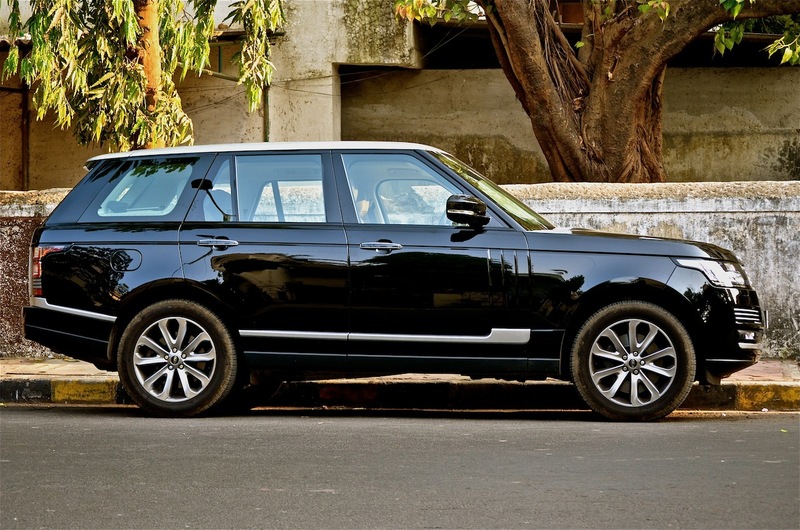 Review: 2013 Range Rover - The Ultimate Car ever made? Lets talk about cellphones. Of late, it has become the habit of the manufacturer to introduce a new flagship every 365 days. And within these 365 days they’ve to come out with a product that is technologically advanced than its predecessor. Thankfully, automakers don’t follow that calendar. 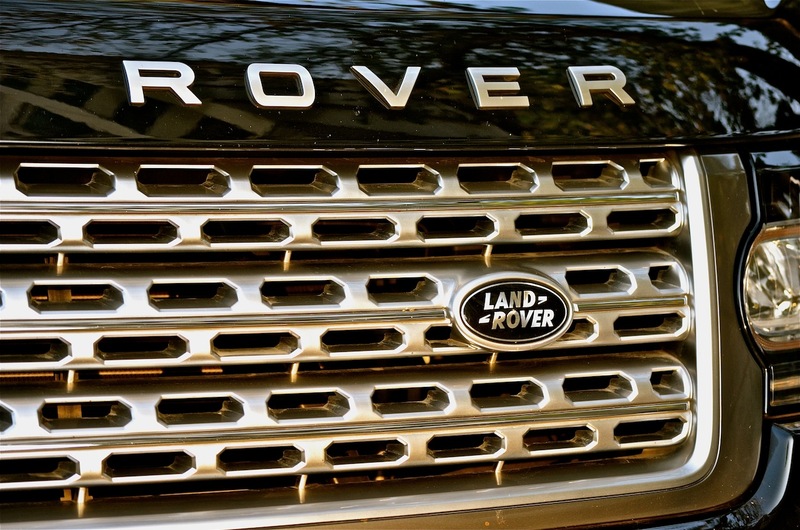 In fact, in the last 42 years Land Rover, have introduced a new Range Rover only four times. 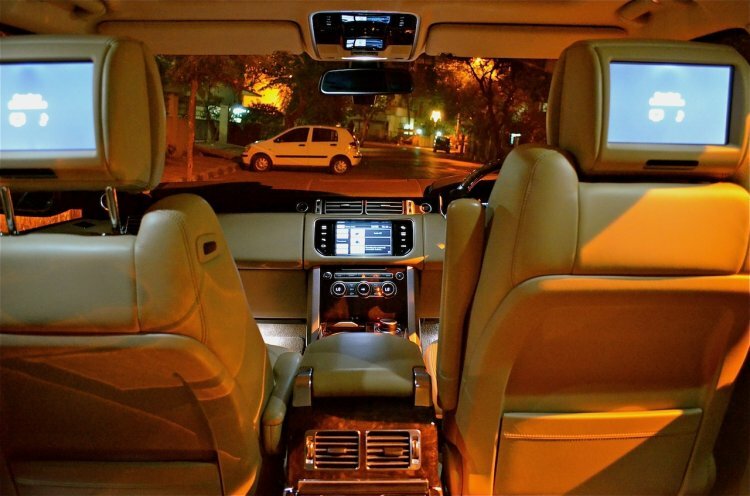 And this is it: The all new 2013 Range Rover. Built to go in such a way that even when the terrain outside resembles the Sahara desert, the atmosphere inside is that of Las Vegas. 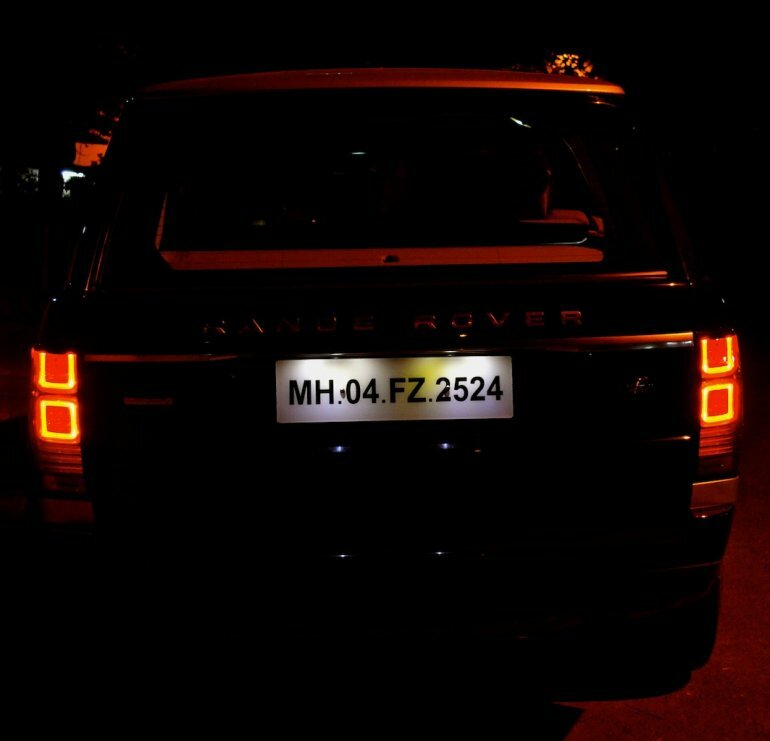 This new one is so much more advanced than the old one and LR would want you to part with 1.74 crores of your fortune for this 4.4-liter V8 diesel version. I think, that is fabulous value for money. You’ll see why. When you or I hit the gym, we’re lured at the prospect of shedding 10 or odd kilos. Land Rover then have the right in boasting when they say the new Rover is lighter by a whopping 420kg! You can think of the Range Rover as a newer stronger version of Rocky Balboa, yet somehow lighter and you’ve the all new aluminium chassis to thank for that. Then there is the all new Terrain Response System with a new Auto function. By pushing a single button, this 2.3 tonne SUV will go over almost any terrain you can find without any further adjustments. The Range Rover you see here is the 4.4-liter V8 diesel in the top-of-the-line ‘autobiography’ spec. I can tell you that it makes 339bhp and emits 229g of CO2 per km. I think it would be much simpler if I told you it churns 700Nm of torque! Yes, this happens to be the ‘torque-iest’ car I’ve ever driven, beating my previous M5 (at 693Nm) and the XKR-S (also at 693Nm). All that torque flows through the wheels thanks to a new 8-speed transmission. 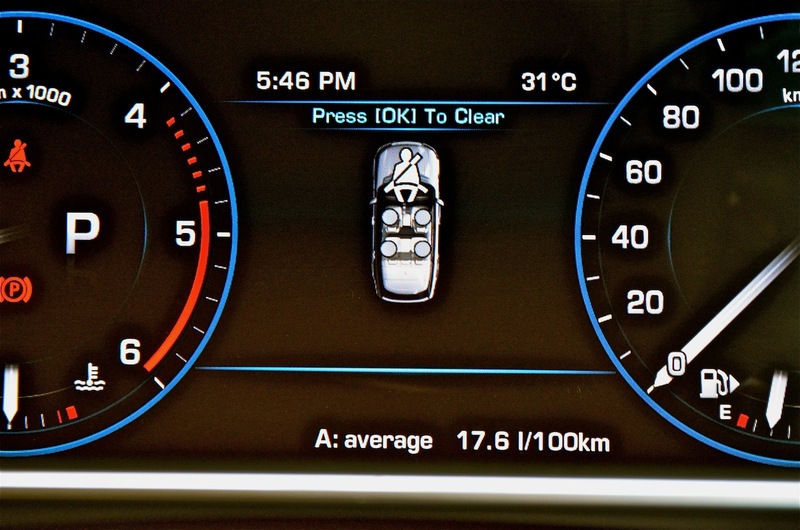 0-100km/h will be displaced in 6.9 seconds and you can see 217km/h on your speedometer. 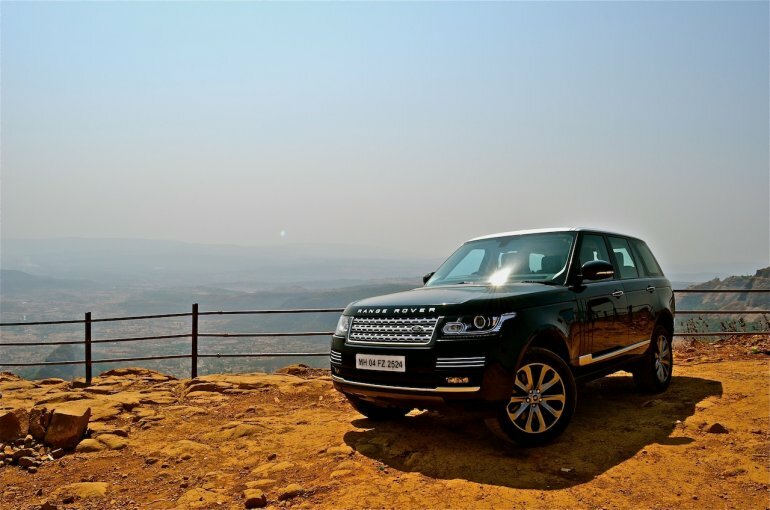 Thanks to the weight saving, LR claim an average fuel economy of 8.69km/l. And then there is the 105 liter fuel tank that will more than suffice for a good adventure. As far as the exterior differences go, the new Range Rover cannot be mistook for anything else. 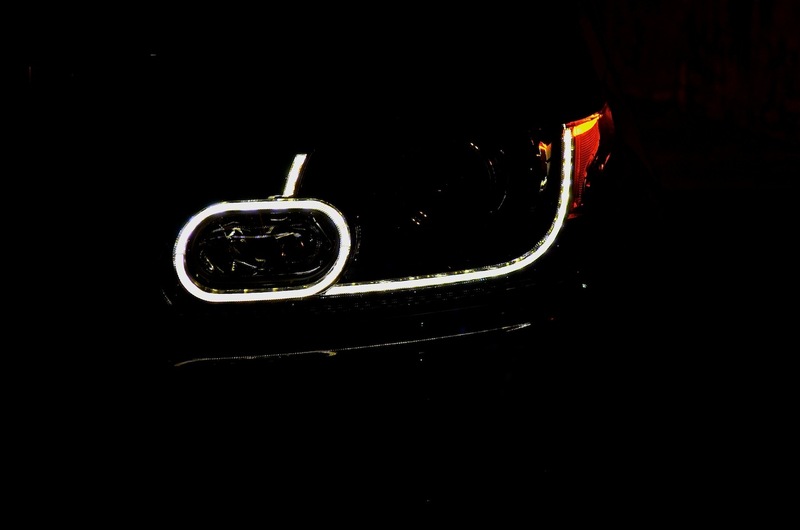 The headlamps have day time running lights while the tail lights look fantastic, especially at night. Otherwise, it is pretty much characteristically Range Rover. Now, I can go about writing about the interior, performance and so on, but I wouldn’t be doing the car any justice. Because, I think this is not one car, but three cars integrated into one. So what follows now are the three identities the Range Rover possesses. The road is the twisty, curvy hairpin infested one, up to Amby Valley. I watch at the beginning of the climb how many people switch off their aircon so that they can tap all the performance their humdrum vehicles can offer. 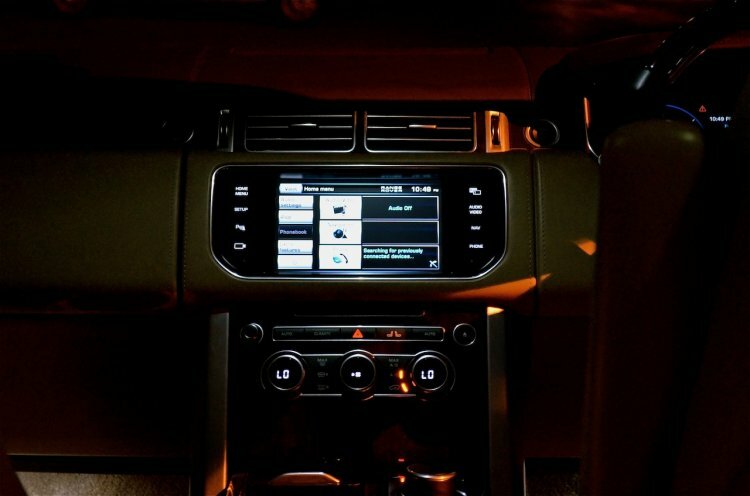 I ask the 4-zone climate control to give me the lowest possible temperature, set the seats to massage my collar bone and knead them properly, turn on the fantastic Meridian sound system so that all four passengers are entertained and set off. Gear lever in Sport with the paddle shifts calling the shots, I turn the slightly slow steering up a steep 180-degree hairpin bend. The result is fantastic even at high speeds! The first thing you’re expecting is the body to roll like a cruise liner. Not on the Range Rover! Body roll is beautifully contained and there is just that little amount to let you know you’re sitting in a SUV 220mm from the ground. On a really tight bend with a sharp steering input and a good amount of entry speed, you can hear those 20-inch wheels searching for grip. 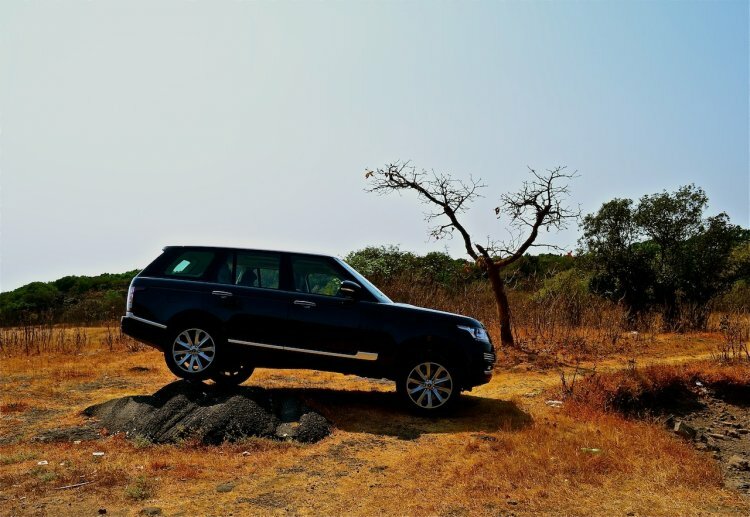 That is how much you can push the Range Rover to its limits, it is genuinely that good. Now for the 4.4-liter V8 engine, words do fail me. Quite simply put, its a beaut. If human beings were to live on torque, this engine can put an end to world hunger. Almost all the torque is present everywhere in the rev range, trailing off only towards the end. Overtaking is a breeze. The fantastic 8-speeder downshifts more than willingly. All you need to overtake Mr. Horn-OK-Please in front of you is a half stab at the gas pedal. This 4.4-liter has the capability to pin you tighter to the seats than a mental hospital’s stretcher. It doen’t matter if you’re going flat out, or just half-pressing the pedal in a relaxed manner, it is properly quick. So it handles well and goes well. But in order to be sporty, you need to sound well. This engine does not sound like its running on petrol or diesel (or thankfully even electricity!). It’s the same sound that you get when a gas turbine is sucking in air. I don’t know how to put in words but imagine a hollow ‘whoosh’. You can actually hear the air being sucked in to the engine and over time you tend to put your foot flat down just to hear it, over and over again. This 4.4-liter V8 easily has what it takes to replace your fast car. And its fun to drive it as well, albeit in a different manner. 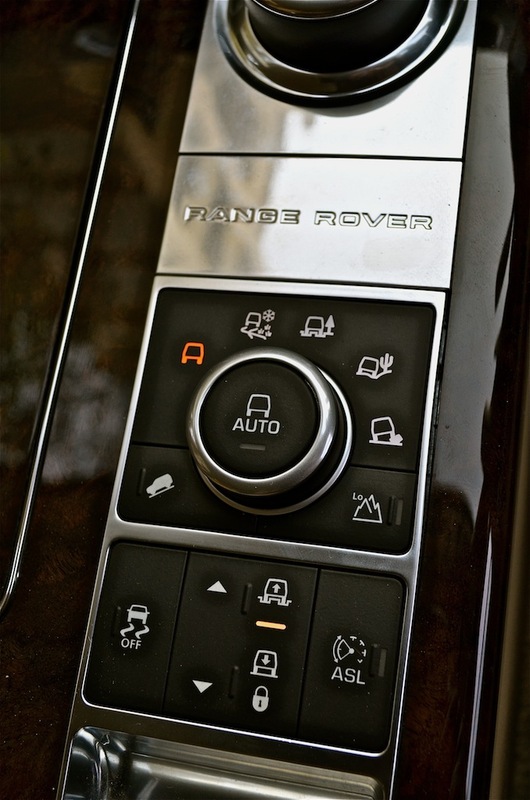 Instead of precision and accuracy, raw brute force will get you going in the Range Rover. Coming to the most important part of the review. How good off-road is the new Range Rover? I didn’t have a chance to put it across a river, but I did nearly everything else. The new Range Rover has an increased water wading depth at 900mm. Now for you off-road yobs out there, the ride height can be increased from 220.5mm to 295.5mm with the push of a button. The maximum approach angle is 34.7 degrees with ramp breakover at 28.3 and departure at 29.6 degrees. What this means is that you can go off-road so easily without even burning a calorie. Going off-road in this is very easy. You first check out the terrain you’re about to enter. 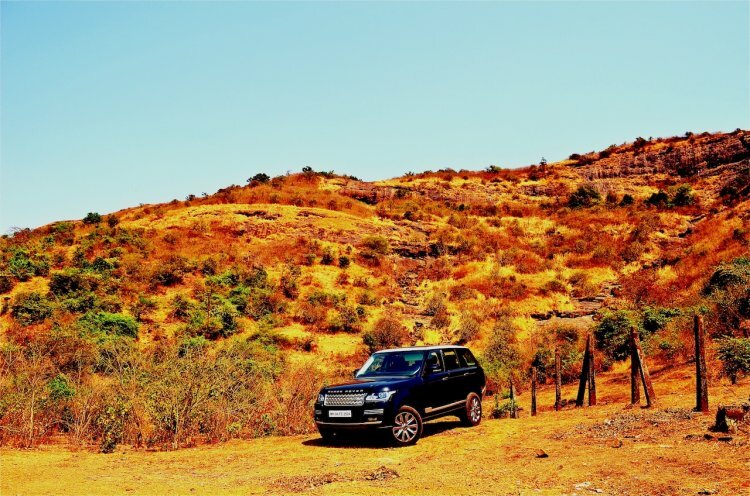 If there isn’t too much rock, hill climbing and core off-road things, you simply enter the terrain, do what you want to do without so much as pressing a button, no sweat at all! The perfect Sahara desert outside, Las Vegas inside car? You bet! If you’re entering a place with steep climbs and rocks you press a button next to the electronic handbrake, and this raises the ride height of the car to ‘Off-Road Height’. Once this is done, you can have all your passengers still engrossed in their entertainment, and simply enter the terrain to do what you want to do without so much as pressing another button..no sweat at all! Should you wish to come down a steep slope, just press the Hill Descent button, take your legs off everything and steer properly. The brakes automatically brake the car and ensure you don’t tumble out of Lonavala. In other genuine SUV’s (the closest being the Mercedes GL Class), when the going gets tough, you can feel the car using all its capabilities to get you across. 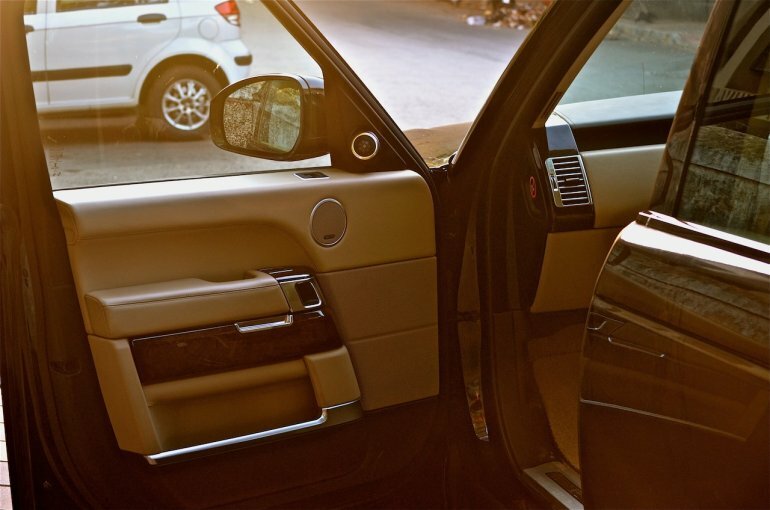 In the Range Rover, its more like a 11th grade student doing 2nd grade mathematics. 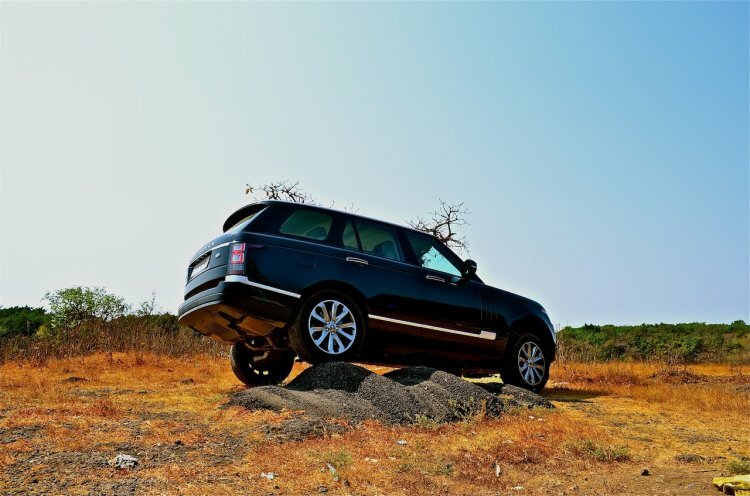 It does it with so much ease that you tend to underestimate the terrain sometimes. For example, the picture here with the rear right wheel on elevated terrain is pretty extreme. All of us, but one rear seat passenger got down to take a photo. Now the guy sitting at the rear did not know where the car was parked. It was only once we showed him the picture did he realize and almost emit a lady like shriek! 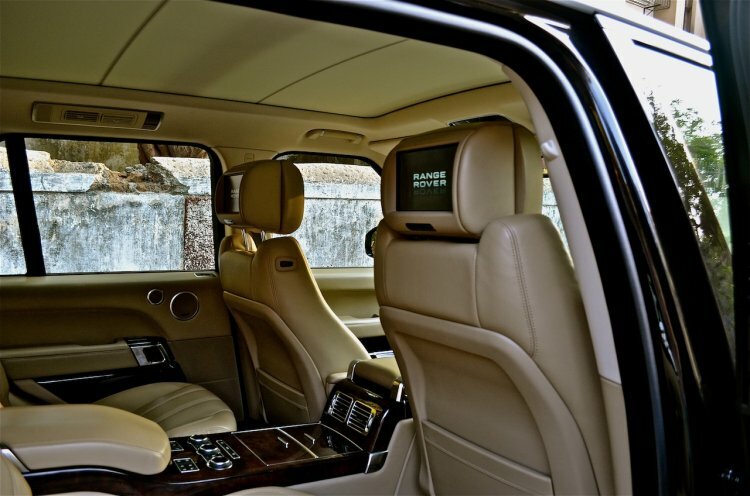 He said that inside, it felt like he was on level terrain, that is the panache with which the Range Rover off-roads. 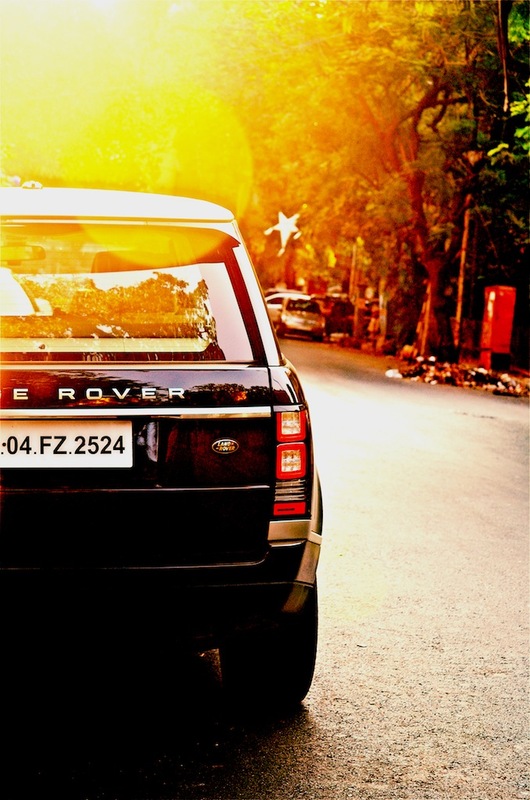 I took this Range Rover over everything I could find. Rocks, slopes, descents, mud, gravel..you name it. I did this while having all the luxury options switched ON and with all my passengers. I did this on standard road tires, without so much as deflating them for better grip. I did this without realizing that I had NOT switched ON the Low Range mode! And mind you, I’m not the best off-roader in the IAB team. And yet the Range Rover was nothing but fantastic. The Auto mode in the Terrain Response system is a welcome addition, especially if you're the kind that cannot differentiate mud from ruts or gravel. It is very quick to react and adapt the car to the changing terrain. 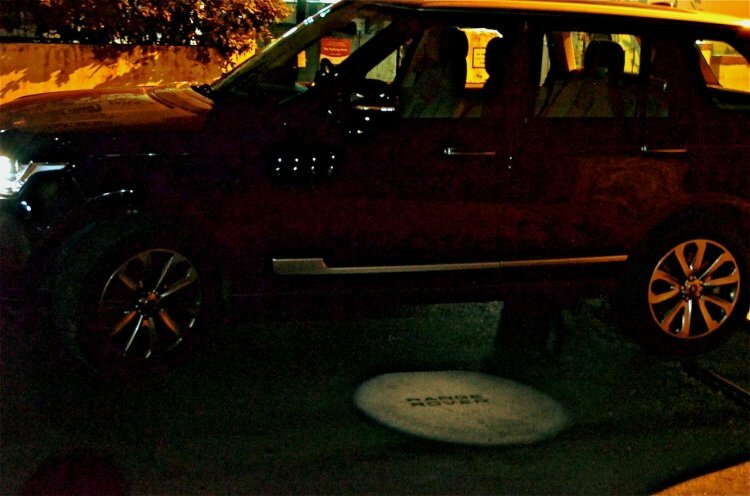 That's the puddle lamp of the Range Rover! Press a button on the key fob and I warn you, for you could faint. A light from beneath the ORVM projects a puddle lamp on the ground. This is something you see even on the Skoda Superb. What you do see on the Range Rover is the projection of the ‘Range Rover’ logo on the ground. Who ever thought of this über cool feature deserves my nomination for an award, if not ten. The best bit however, is inside. Open the massive doors, which in itself has cubby holes made to feel like chestnut wood drawers and you’ll be speechless. 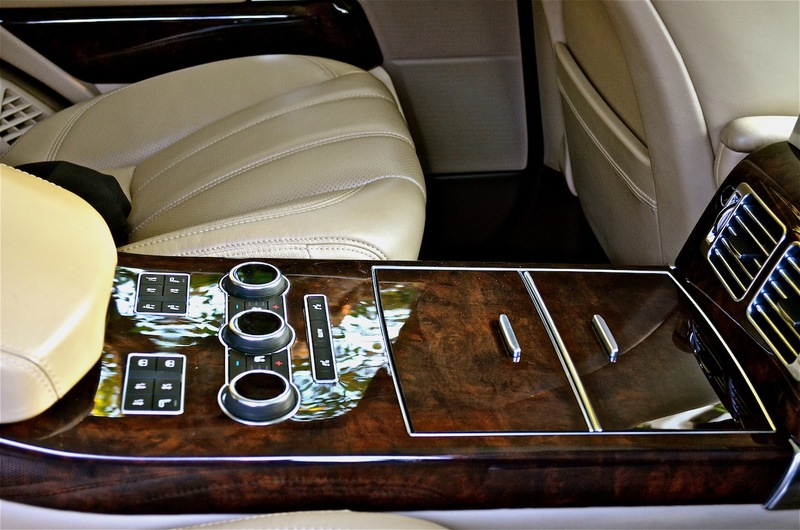 Gone are the million buttons stacked on the central console. What you get instead is barely half a dozen. 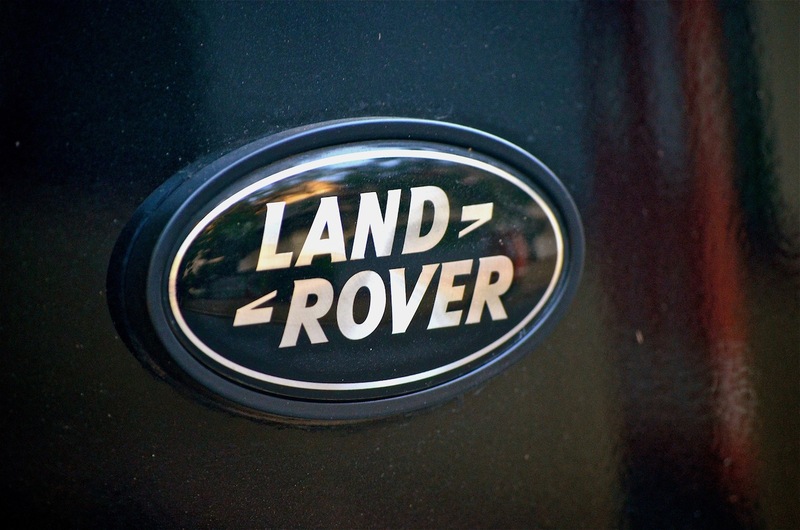 Gone is the all black ‘Land Rover’ logo-ed steering wheel. What you get instead is a ‘Range Rover’ logo-ed beige steering wheel. The center of the steering wheel is finished in fine leather, while the top and bottom have wood accents. 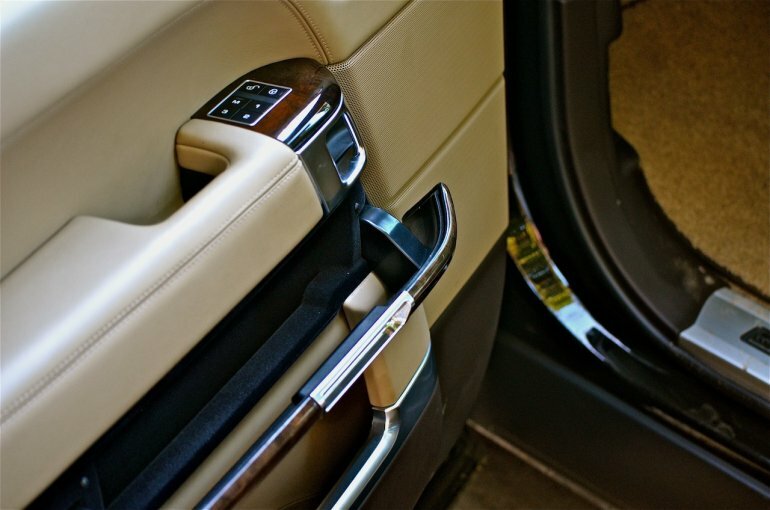 The front seats feel like expensive Sofas, and they’re better for they massage you as well. Get the optional 2+2 seating and you get massagers for all the seats. 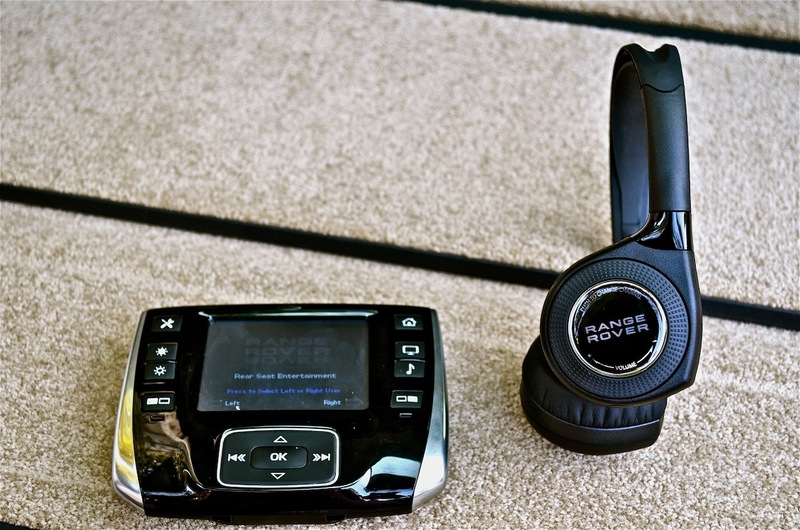 For INR 5.9 lakhs you get rear reclining seats, while for INR 2.8 lakhs you get a 1200W stereo system. That’s not expensive, when you factor that BMW charges a whopping 6 lakhs for a B&O system and if you want your 6 Series to have contrast threads on the stitches you need to cough up 70 grand. Would Sir fancy a glass of champagne whilst watching the 9o clock news? At the rear, the passenger is literally the king. He/She has access to individual seat adjusters, massagers, cooling/heating for the seats, 4-zone climate control, two individual DVD screens, an Emirates airline like touchscreen remote for the entertainment, high quality stereo headsets and acres and acres of leg, shoulder and any other room your body part may desire. 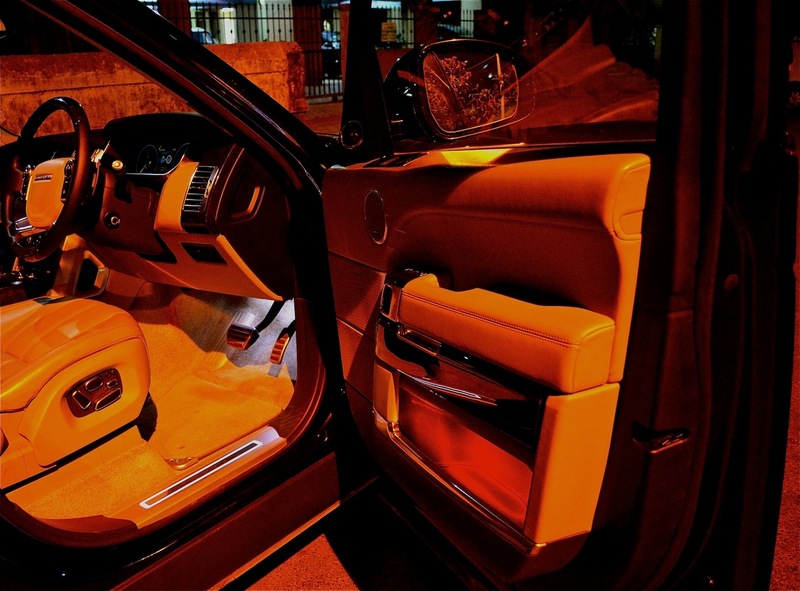 Previously, the Range Rover’s interior was built to rival the S Class. 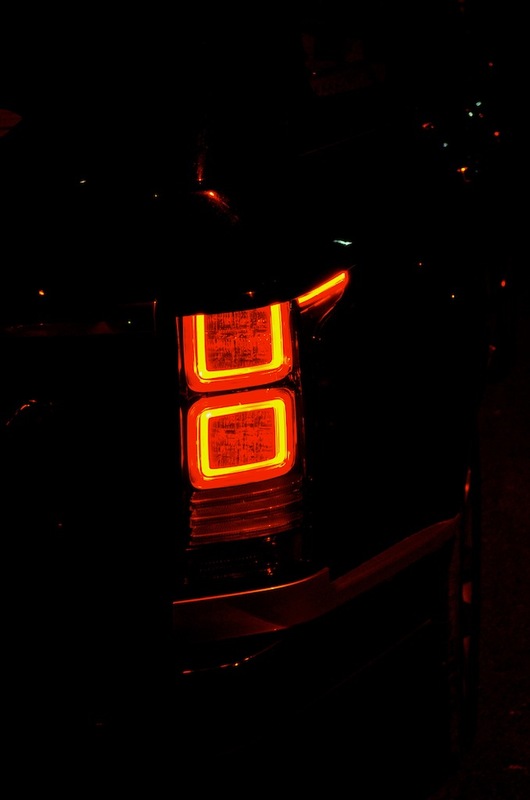 Now it seems that the Rolls Royce Ghost has been set as the target. And they’ve nearly done it. It certainly surpasses the current S Class, I can tell you that. When you press the Start/Stop button, a rotating gear lever rises out from underneath, making you believe that you’re in a Jaguar; The all-digital instrument cluster lights up and it is only then that you realize that the speedometer and tachometer are digital, not analogue. Where the Range Rover can be mistaken for the Rolls is in the ride quality. Picture this: Really bad roads with rough edges and uneven speedbreakers and you can do about 80km/h without feeling anything. You know when you’re in an aircraft taxi-ing on the concrete tarmac and all you feel inside is the wheels going over the joints of the concrete? 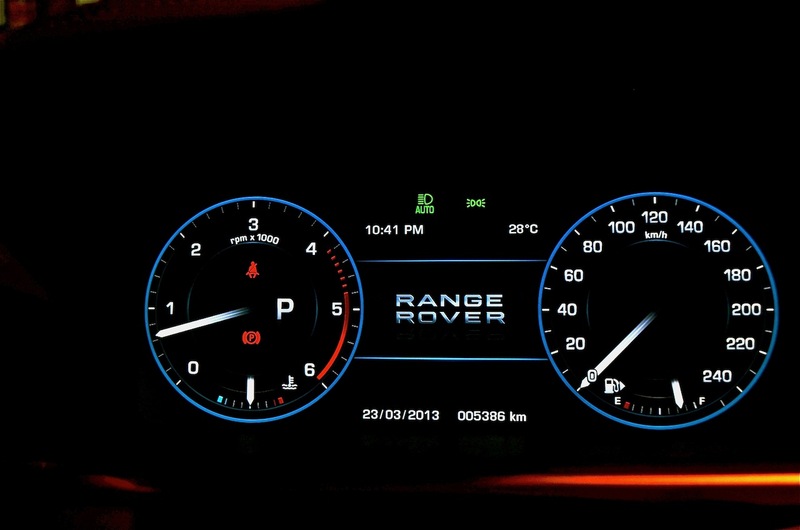 That’s what you feel inside the Range Rover at 80km/h over really bad roads. This is how I think the suspension works in the car. The car senses the bad roads ahead. Immediately, it sends a message to a dozen laborer’s who arrive on the spot, patch the road up ASAP and then move on to the next bad stretch where you might drive. 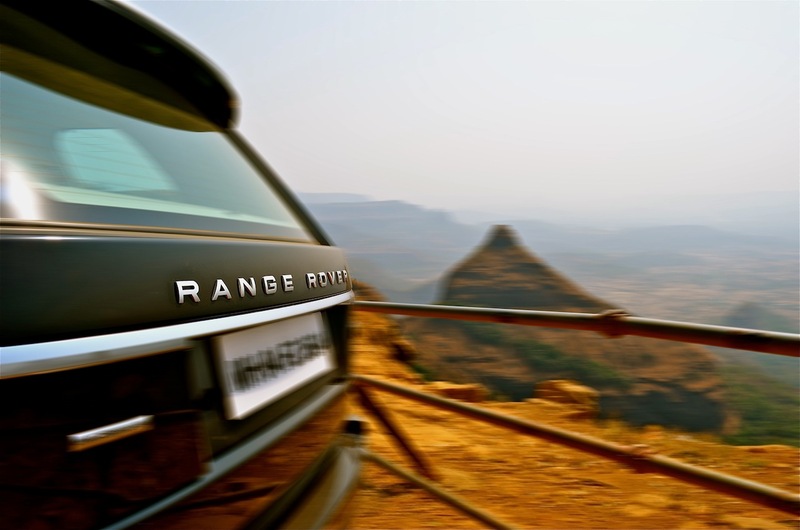 Even when you’re driving on no-roads, the ride quality of the Range Rover is something your backbones want to be married to. 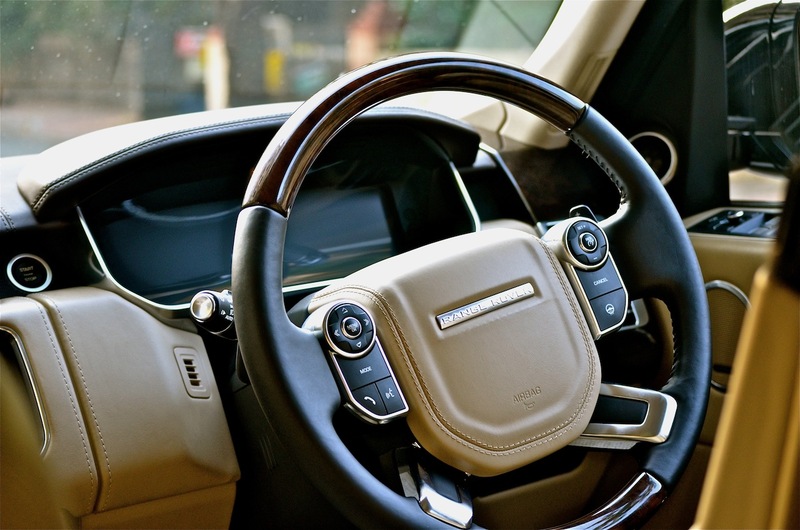 It is safe to say that the Range Rover CAN replace your Roller, if you’re particular about ride quality. It has that air of waftability to it, that's for certain. The super smooth gearshifts only accentuate this further. How much did it average? The usual suspects follow for the Range Rover: I never bothered to drive it with a light foot, it was driven with four full size adults all the time, seat massagers, coolers and entertainment systems were used throughout. But adding on, it has a 4.4-liter V8 engine sending ponies to the permanent all wheel drive layout, it weighs 2.3 tonnes, it was driven flat out on the road to Aamby Valley and back and considerable off-roading was done as well. At the end, 5.7km/l is what the Range Rover averaged. If that’s not fantastic, I don’t know what is. And then, when you need to refuel that gargantuan tank, you find out that the viscous liquid costs a good 20 bucks less/liter than something they call petrol. Or even worse, high octane petrol! The Range Rover's split boot lid is now electrically operated and can be done so using the key fob itself. 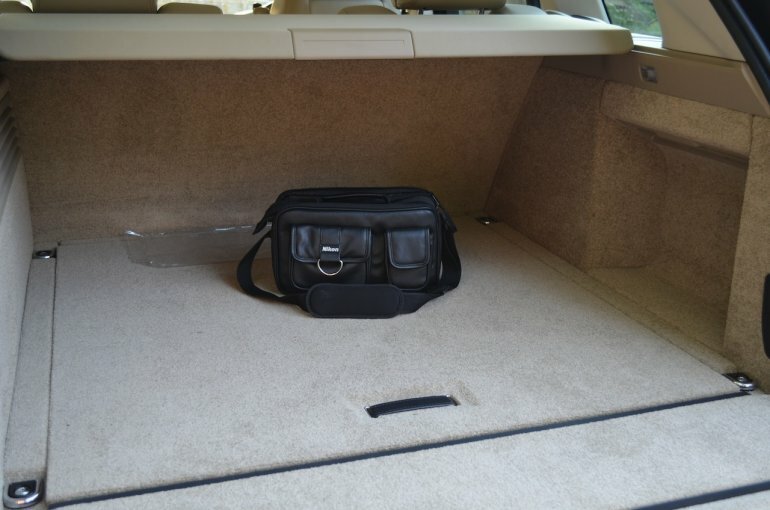 Boot space is more than adequate at 909 liters. The standard wheel rim size is 20-inches and that can be specced to 21 or 22-inches, though the ride comfort is supreme in the 20. 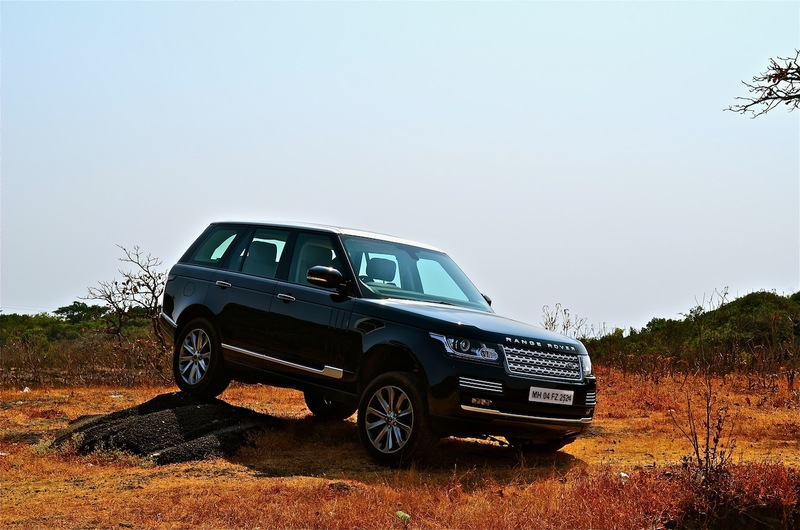 In India, Land Rover has just added a new variant to the Range Rover, the 3.0-liter V6 diesel. It starts from 1.44 crores and extends to 1.6 crores. The next variant, which happens to be this SDV8 will set you back by 1.7 crores. Finally, you can get the 5-liter supercharged V8 petrol for about 1.75 crores as well. Note: All prices are for Mumbai. 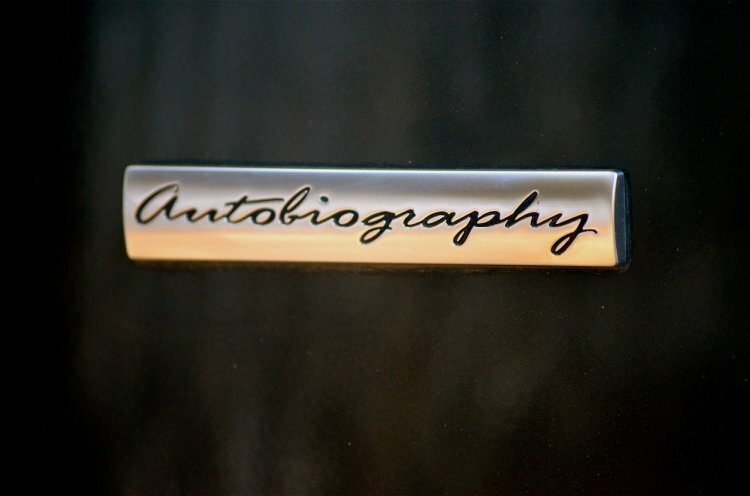 This SDV8 Autobiography model costs 1.7 crores ON ROAD. The ex-Showroom price of the SDV8 comes to about 1.3 crores, with octroi, taxes and insurance adding major chunks each. If you were to buy a mobile phone right now, will it have a screen so big and powerful that it can replace your home theatre, or will it have a camera so good that your SLR will be junk? In the world of automobiles, we have a car that can replace three of your already existing ones. Ladies and Gentlemen, I give you the all new Range Rover: A car that will replace the luxury SUV you already have, that will replace the Rolls Royce you already have and maybe even the sportscar you enjoy having limited blasts in. All for 1.7 crores. Fantastic value for money, isn't it?